Here is my second picture from Chalice Well, in Glastonbury, which I visited last weekend. 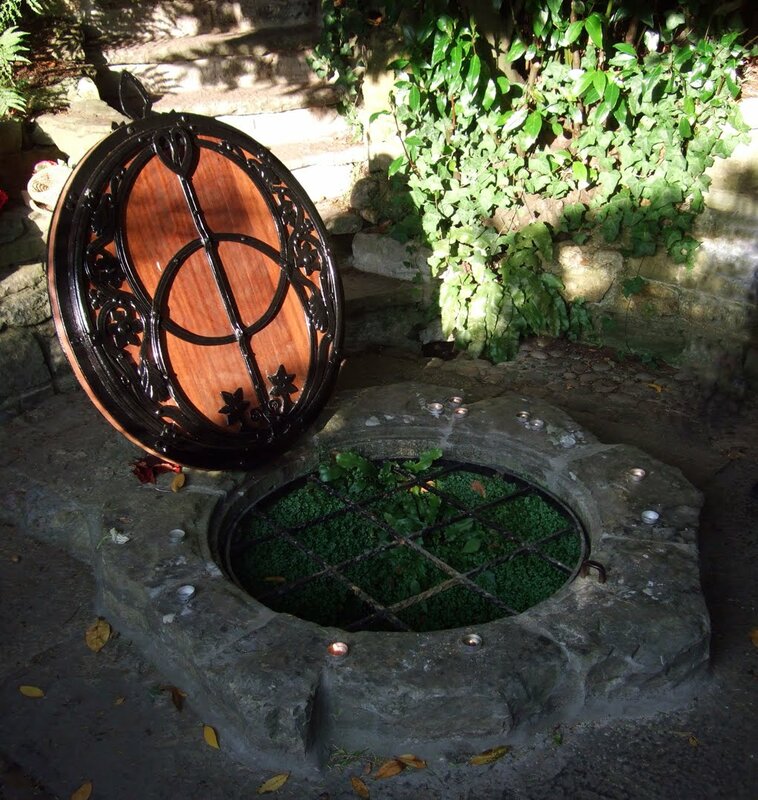 The beautiful well cover is made of wood and adorned with a wrought iron vesica piscis, with a lance passing through it. According to the Chalice Well website, the vesica piscis is based on a medieval design of a sacred symbol of two intersecting circles. It symbolises the union of heaven and earth, or spirit and matter, and is considered meaningful within Christianity, Freemasonry, some forms of Kabbalah and New Age spirituality. The wellhead is in a beautiful, tranquil space where visitors can sit for quiet contemplation, often lighting votive candles and spending time meditating or praying. It is a very popular location - especially on sunny afternoons - and several people where there when I took the photograph above. In fact, I had to Photoshop out someone's leg and foot from the edge of the image. If you look carefully, I expect you can see where the picture was altered - and also spot my shadow on the ivy behind the well.